Years of understanding of this domain, has helped us in presenting patrons with the optimum quality of Dialysis Machine. Used in hospitals and medical colleges for the purpose of clinical purification of blood, the dialysis machine is easy to operate and is known for its consistent performance. 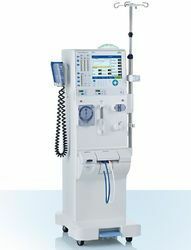 By following quality centric approach, the quality of the dialysis machine is never compromised. 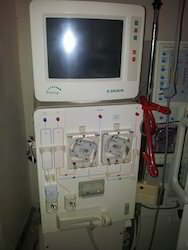 Operational efficiency Hemodialysis involves a large number of demanding manual operations all around the hemodialysis machine. The ergonomic design and the logical operating structure of The Next Generation 4008S permit easy handling as well as fast and intuitive programming of the treatment parameters. Important treatment values are represented graphically on the 10.4” TFT-LCD monitor, which supports easy comprehension of the ongoing treatment, and provides a fast overview of the treatment history. The Blood Pressure Monitor (BPM) is fully integrated, which further simplifies handling for the therapy providers. In combination with the Therapy Data Management System (TDMS) daily dialysis practice can be organized in a more effective and efficient manner taking full advantage of an online data acquisition and management tool. The non-invasive and precise Kt/V assessment is consistent with conventional blood sample-based methods enabled by urea distribution volume V measured with the BCM-Body Composition Monitor. Ultrapure dialysate fluid is acknowledged to be an integral part of all contemporary dialysis equipment. Naturally the DIASAFE® plus is an essential part of the basic configuration of all current Fresenius Medical Care dialysis machines.